When is not being completely honest about a product’ benefits considered consumer fraud? Or more precisely, lawsuit worthy? L’Oréal might be about to find out. They got hit with a consumer fraud class action lawsuit recently, over allegations its Total Repair 5 Damage-Erasing Balm doesn’t do what it’s supposed to do. Ah expectations. They are so dangerous. Remember what the folks who bought Wen Cleansing Conditioner were expecting? Given the name, Total Repair 5 Damage Erasing Balm, I’m not sure what, had I purchased the product, I should expect. The words “repair”, “erasing” and ‘balm” all appear in the name. So, does this product repair, remove or soothe your hair? Well, hopefully not remove (again, flashback: Wen…). Surprisingly, according to Manhattan resident Vivian Lee, Total Repair 5 Damage Erasing Balm doesn’t do anything. Say whaa…? Would never have guessed. And, perhaps that’s a good thing, given that L’Oreal can’t seem to decide on exactly what it is supposed to do—if the name is any indication. But—Lee claims that the product didn’t even come closer to approaching a “total repair” (whatever that means) of her hair. She claims L’Oréal “consistently conveyed the very specific message to consumers that the product will “repair up to one year of damage in one use,’” but “there are no ingredients in the Total Repair 5 Damage Erasing Balm that could actually repair a year’s worth of hair damage ‘instantly,’ particularly after one use.” Nothing works instantly after one use, except Twitter. Come on now! I’d be interested to know what one year’s worth of hair damage look like? Baldness? Thinning, patchy hair? Bright orange hair with white roots? What? My idea of damage and yours could be very different. L’Oreal does however, try to cover its bases, by stating that its product would allegedly fix split ends, weakness, roughness, dullness and dehydration in hair. But the science has it, in the end. According to Lee’s complaint, hair is made of keratin proteins, yes—we knew that. 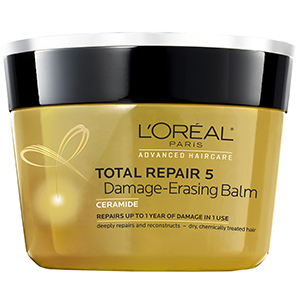 But, sadly, there are no keratin proteins in L’Oreals’ Total Repair 5 Damage Erasing Balm, so said product can’t do what it says. The product’s main conditioning ingredients, according to Lee, are behentrimonium chloride, amodimethicone and hydroxypropyl guar. And she says these ingredients are common in other products that do not claim to repair hair instantly. Lee is looking to establish a nationwide class and a New York subclass. Her claims include violations of the New York general business law, negligent misrepresentation, breach of express warranty and unjust enrichment. FYI—The case is Lee et al. v. L’Oréal USA Inc., case number 1:16-cv-09266, in the U.S. District Court for the Southern District of New York. This was posted on Wednesday, December 7th, 2016 at 11:47 am and is filed under Class Action . Feel free to respond, or trackback. Read our comments policy.